37. 3D Model Printing – Who To Contact? - KJ Kuchling Consulting Ltd.
One of the technologies that is still getting a lot of press is 3D printing. It seems new articles appear daily describing some fresh and novel use. Everything from home construction, food preparation, medical supplies, and industrial applications, 3D printing continues to find new applications in a wide range of disciplines. Their 3D printed models are used in the same way geologists and mining engineers have employed models for decades. 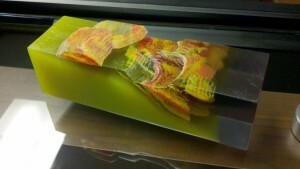 In the past we saw the physical models made of stacked mylar or plexi-glass maps, wood or foam core. We recognized that there is value in taking two dimensional sections or plan maps and making a 3D representation. This provides more information than those viewed on a computer screen. Physical models convey scale, interactions and scope in ways that no other method can. Technology like 3D printing improves the model-making process by allowing the addition of high def orthophotos, reducing the model cost, increasing its precision and delivery time. Currently 3D models can be made in a variety of materials, but the primary three are extruded plastic, gypsum powder, or acrylics. Plastic models (ABS or PLA) are cheap, fast and can created on relatively inexpensive, hobbyist printers. The downside to these models is that the number of colors available in a single model are limited, typically a single color. 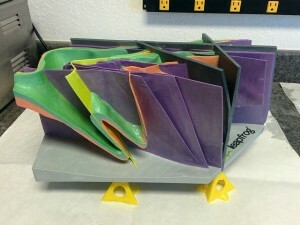 Powder-based printers can typically print in 6.5M colors, allowing for vibrant, photo-realistic colors and infinite choices for title blocks, logos and artistic techniques. However, gypsum models can be as fragile as porcelain and require some care in handling. 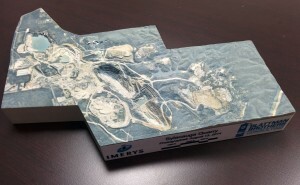 Acrylic models allow for translucent printing (“looking into the ground to see the geological structure”) and are more durable than the gypsum. Nevertheless, acrylic models are significantly more expensive than the other two types and the color palettes are limited. 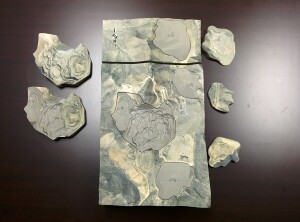 Besides having another toy on your desk beside your stress ball, why not print off your mine plan, or print the geology shapes and topography? It’s all about communicating highly technical data to a non-technical audience, whether that audience is a permitting authority, the general public, or maybe even company management. The ability to grasp a map or technical drawing is a learned skill and not everyone has it. If you’ve just spent $20M on a feasibility study, why assume that the attendees in a public meeting will fully appreciate the scale and overall impact of your proposed project with 2D maps? That message can be better conveyed with a model that is easily understood. One of Blattman’s clients, Luck Stone, recently described how they use their 3D printed models in this video. Blattman’s models are created from the same 3D digital data already in use by most companies involved in geological modeling and mine design. Other than the units (meters versus millimeters), the triangulated surfaces created by the software are no different than those created by mechanical or artistic 3D modeling programs. While many 3D printing services are available on the market, not all of them are able to speak “mining”. They may not be able to walk the skilled geologist or mining engineer through the process of creating the necessary digital formats and that’s where Blattman comes in. With more than 20 years of mining experience and having already gone through the 3D printing learning curve, they can assist any natural resource company through the process, either as a full-service/turn-key project or just to advise the client on how to prepare their own files. The bottom line is that 3D printing is here to stay and its getting better each year. Go ahead and check out the technology to see if it can advance your path forward . We would be interested in hearing about any experiences your have had with 3D modelling, pro’s and con’s. Tagged: 3D Mine Model, Environmental, Feasibility Study, Mine Engineering, Study Management. ‹ 36. Fluid Tailings – Time to Kick The Habit? For those interested in learning more about 3D printers, this link has some reviews. Very interesting! I can see applications for dam design, among other aspects of mine planning. Plans and sections are just paper representations of reality. A 3d map would be a much better and more accurate representation. However I still like my bench plans when I visit the pit! Maybe someone needs to invent a mine site pop-up book like the kids have. Hand them out at public meetings or take them out in the field. Open the book and up pops the topography, plant site, waste dumps, TMF all overlain on an orthophoto.